You’re not getting away that easily. First of all sorry to hear that things got worse rather than improve. But that’s not enough reason to throw out the baby with the bath water. Rest up, get the surgery done, and then see where you’re at. 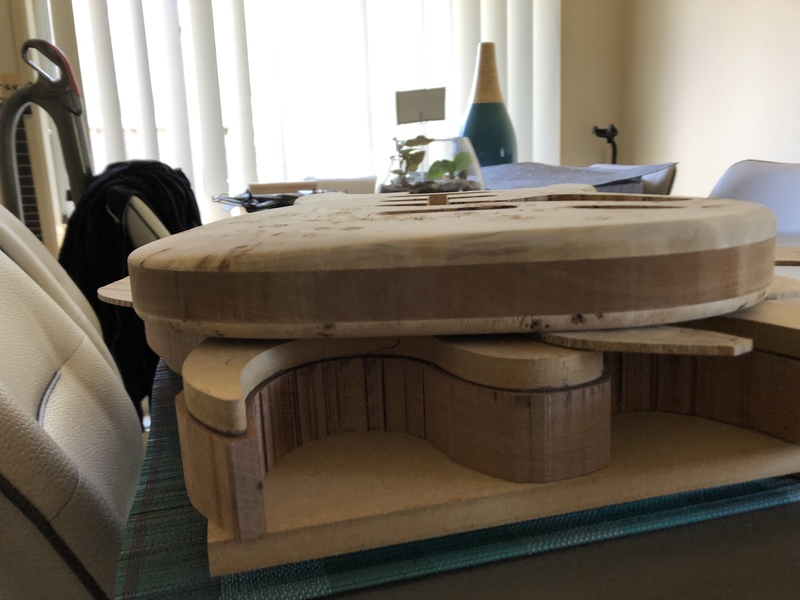 The lutherie forum definitely needs you - the more quirky out-of-the-box threads the better, and you always have great comments and suggestions. I’ll linger around for sure I enjoy watching the builds come together about as much as I do building my own. 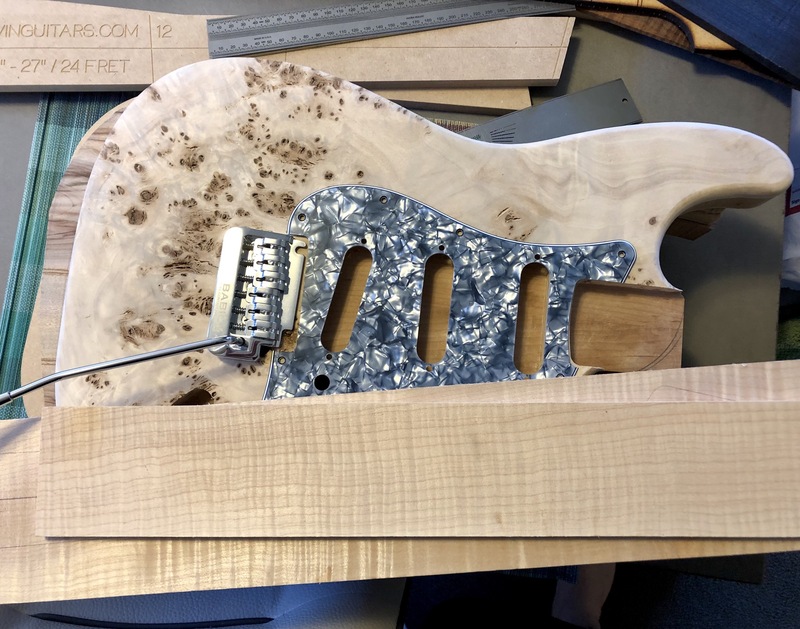 That burl still gives me nightmares, in that I remember how hard it was to stabilise and fill up all the holes. But in the end it comes up so nice and this will be, without doubt, no different. Gidgee is my go to board now and that one has a nice figure on it, is it "ring" gidgee or standard? Pearl might be nice with the poplar. 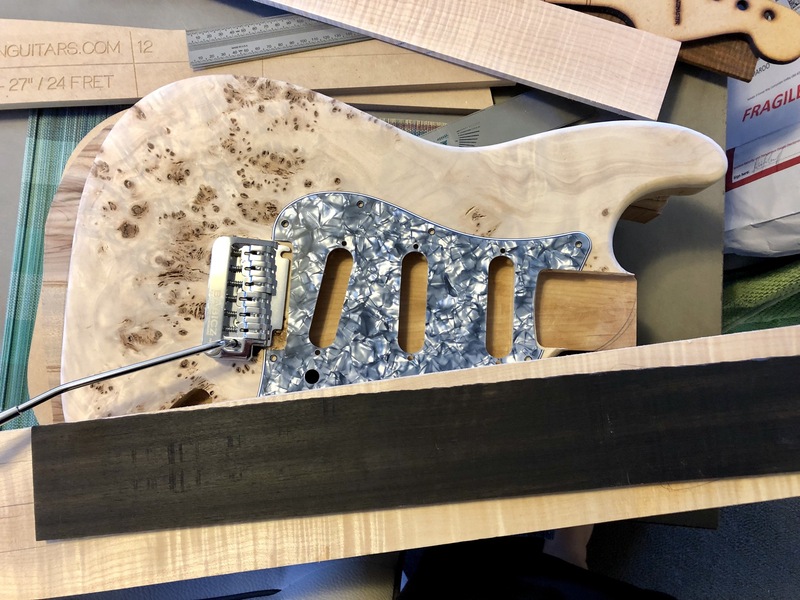 I actually think that pickguard looks good. 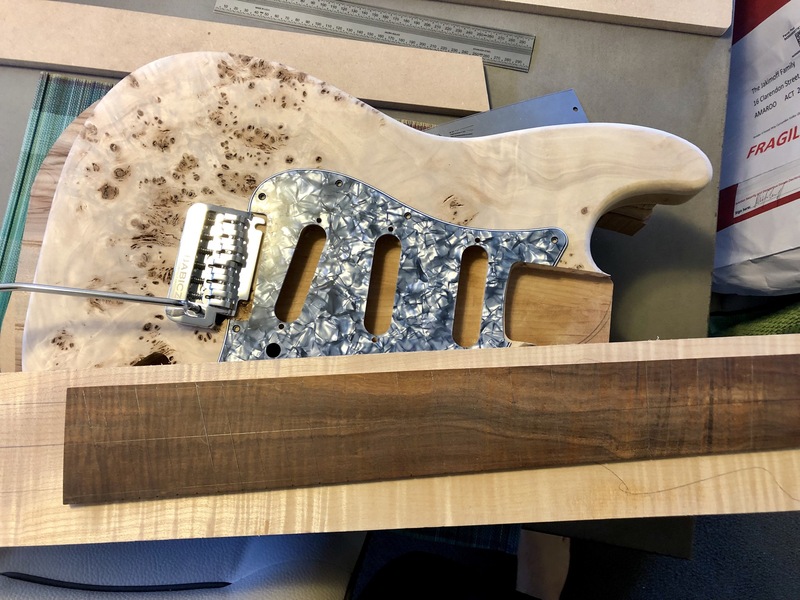 EDIT: And the pickguard kind of matches the hardware. DONE. Good to see you back on! Another opinion (like you need one): gidgee hands-down, and a plain pick-guard. 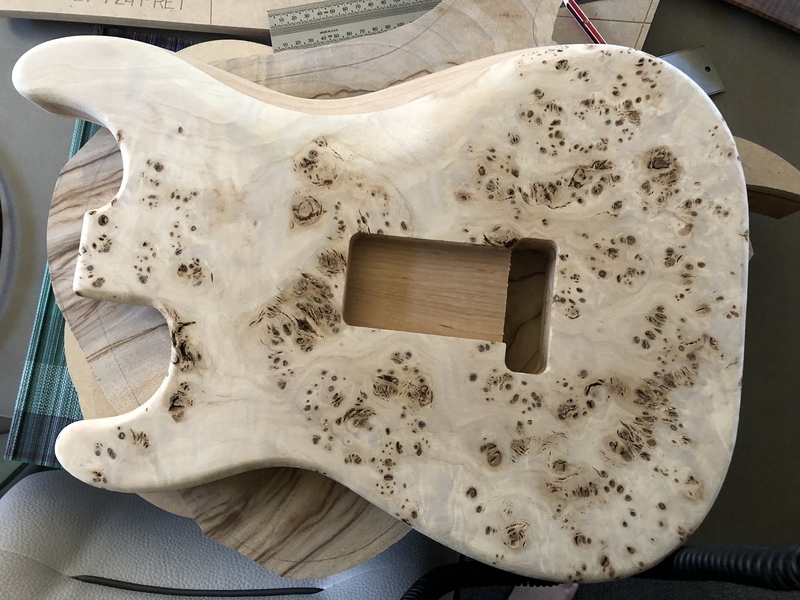 I think you you a "quiet piece" with all the grain and burl action happening with the board and the body. Don't know which colour but it would have to be something subtle. Are you going to leave the body as is or are you going to fill the holes? 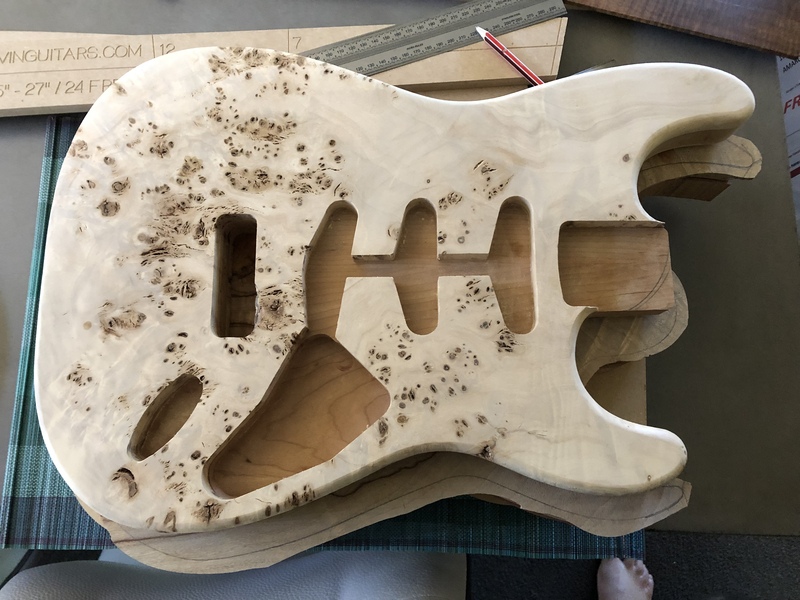 Used a fair amount of Araldyte mixed with Gidgee dust to fill my holes but had to go over it 4 or 5 times because as soon as I sanded down one layer I'd see more holes. Worth the effort in the end though but that timber is soft.